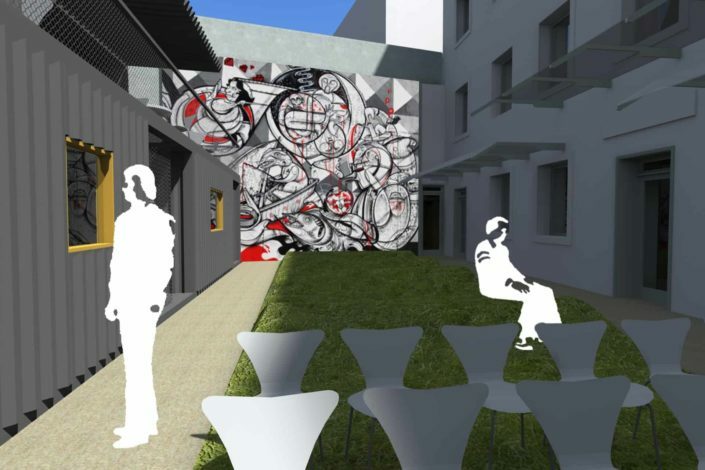 A new Youth Centre is being planned in Nodilova street, Split with the aim of providing organized information, education, counseling, socialising, cultural events and strategic improvements in quality of life, organizing events related to strengthening the role of youth in society – all together raising awareness of its importance. Such a wide scope of activities suggests the possibility that this Centre, given its location as well, might become a generator of wider urban activities in our city. 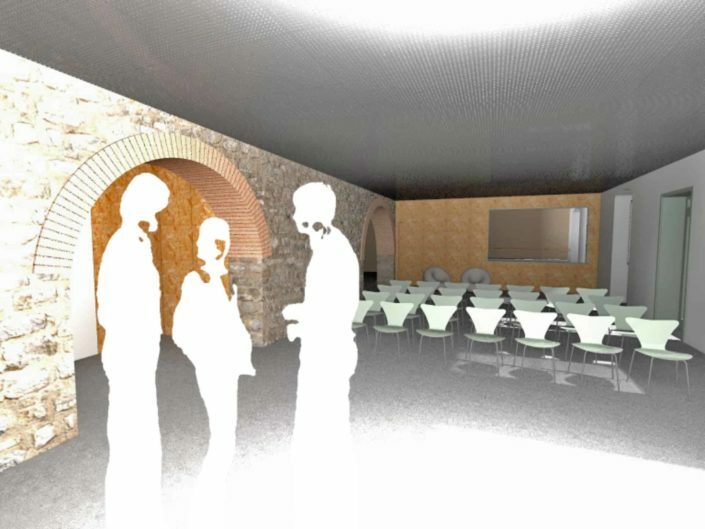 The goal of the Centre is to enable space for running a variety of different activities and purposes: screenings, lectures, press conferences, smaller exhibitions, public debates, free internet access, office space, space for educational and workshop purposes and accommodation for guest contributors. The first room, lying next to the entrance, contains the information desk and a 6 computers for Internet access. It is followed by a separate office space with large openings from which one has overview of events in the multipurpose hall and entrance corridor as well. 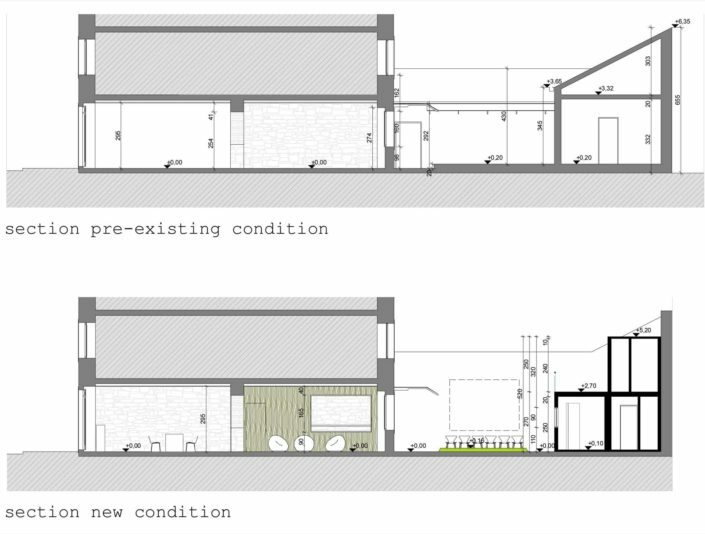 The third and fourth rooms, a multipurpose hall and educational space can be joined into a single space. The multipurpose hall (when used as a lecture hall) has a capacity for 60 seats, while by merging the two spaces, there is space for an additional 30. The fifth group of rooms are service areas. 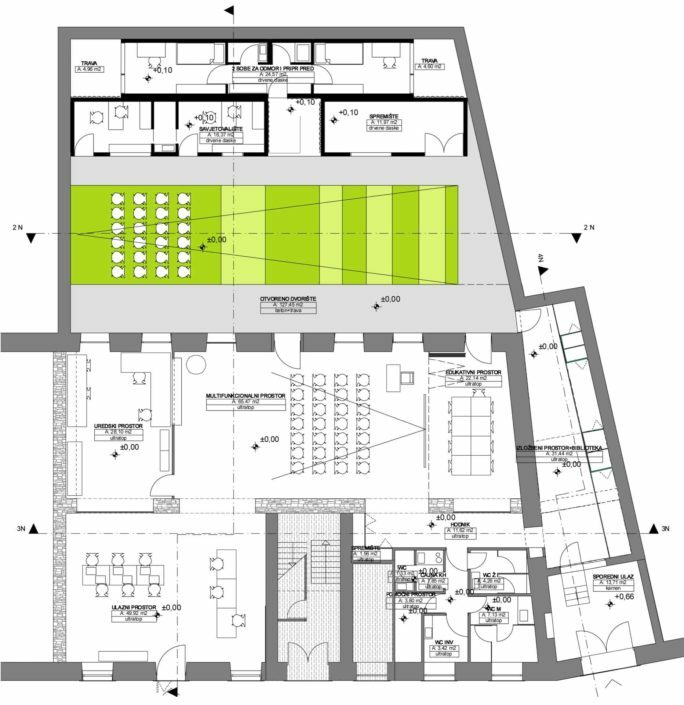 The sixth room, to the right of the service and educational rooms, is a corridor providing direct contact between the street and the courtyard area. This space is a showroom and library space. The books are located on the gallery, which is accessed by ladders sliding along a metal bar. The gallery has a series of intimate spaces – niches and shelves with books that allow peace and concentration while reading. We use the courtyard as a space for socializing, video screenings, literary readings, musical gatherings… The existing improvised warehouse is removed and most of the court will be covered with grass. In the section close to the projection screen, the grass is flat, while further away there are elevated waves of embankments ideal for seating. The courtyard also provides space for open lectures for about 100 people. 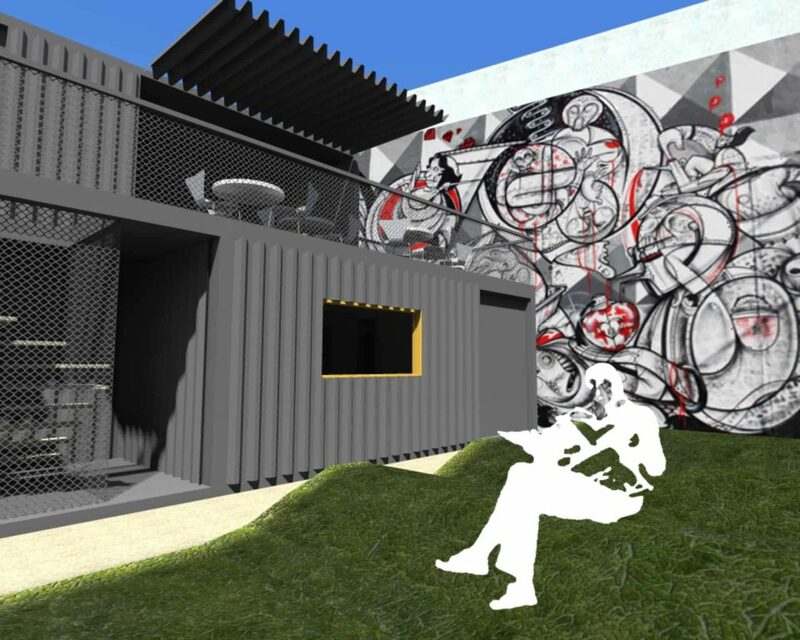 The existing dilapidated house will be demolished and in its place we put recycled containers. Containers can be brought over across the post office courtyard to the west. The very decision to put the container comes from two reasons. The first reason is the ecological and economic viability of such a solution. Environmental sustainability stems from the recycling process, and the economic, apart from the fact that stacking containers is cheaper than new construction, from the possibility of easy removal or conversion. Another reason for the use of container space is the attractiveness gained, which can be very well seen in the project Container City in east London, the project of Urban Space Management, which has managed to generate a new attractive and lively urban centre in a neighborhood which before placing recycled containers was inconspicuous and rarely visited.